Last week, the New York Times published an article about how the US was inserting provisions in NAFTA negotiations to restrict the ability of Mexico to put warning labels—similar to those in Chile and other countries—on ultraprocessed “junk” foods. In response to questions by Rep. Lloyd Doggett (Dem-Texas), US Trade Representative Robert Lighthizer argues that front-of-package labels are a form of protectionism. A more compelling reason is that food companies are worried about the possible spread of front-of-package warning labels like those in Chile, Ecuador, and other countries. I have a long-standing interest in front-of-package labels and wrote about opposition to the warning-label movement recently in a commentary in the American Journal of Public Health. More countries, and certainly the United States, Canada, and Mexico, should give consumers easy-to-read front-of-package labeling that quickly communicates the information they need to avoid diet-related diseases…This is not an “America First” policy; it is an “Industry First” policy, conducted at the expense of the health of consumers in the U.S. and abroad. Julia Belluz (Vox) describes the effects of a provision like this on Canada’s front-of-package labeling proposals. Mexico’s outstanding food advocacy coalition, the Nutritional Health Alliance, argues that this pro-industry effort to block warning labels poses a serious threat to consumer rights and public health. Here’s my prediction: front-of-package labels will be a big international deal this year and I will be writing about them often. Hat tip to Bernard Epel of Tel Aviv University for forwarding this information. I’ve been hearing a lot about Canadian food politics lately—lots is going on up there, apparently. A variety of nutritious foods and beverages are the foundation for healthy eating. Processed or prepared foods and beverages high in sodium, sugars, or saturated fat undermine healthy eating. Knowledge and skills are needed to navigate the complex food environment and support healthy eating. Guidelines should consider determinants of health, cultural diversity, and the food environment. I hope these get a lot of support. II. 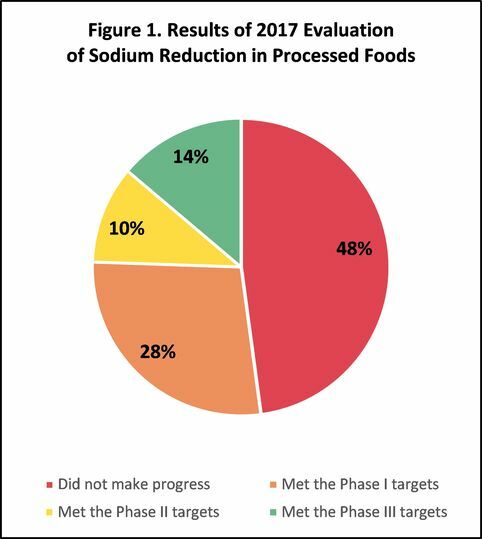 Sodium reduction in processed foods. Health Canada has just announced the results of its study of how well voluntary sodium reduction is working. The evaluation results are disappointing, and much more needs to be done. Mandatory reduction, anyone? III. Front-of-package labels. Dr. Yoni Freedhoff writes that the Canadian food industry does not like what Health Canada is proposing to do about front-of-package labels. For more about this dispute, see this article from The Globe & Mail. IV. Farm-to-school grants. Yoni Freedhoff also writes that Farm-to-Cafeteria Canada is offering $10,000 grants to Canadian Schools to set up such programs. Details here. The Hartman Group has a handy Infographic on the effects of front-of-package labels on purchasing patterns. I haven’t seen this summarized so nicely anywhere else. And here’s the whole thing. It would make a great poster, no? The FDA is responsible for food labeling but in the peculiar way things get done in federal agencies, the USDA governs front-of-package labeling for organics and also gets involved in labels for non-GMO, no-antibiotics and those for country-of-origin. There are fundamental tradeoffs in how information is presented to consumers. If it is presented simply, then important nuance or complexity may be missed. On the other hand, if standards and labels attempt to convey complexity, then consumers may just be confused. Policymakers and marketers will need to consider these tradeoffs in the future when developing new process-based labels. What the USDA does not discuss is the fundamental issue behind fights over food labels. They work well to discourage people from buying products that may not be good for them or do not meet their values. That’s why the food industry opposes them so strongly. A colleague in France, Serge Hercberg, a nutrition professor at the University of Paris writes to say that the French government’s decision on October 31 to support voluntary adoption of a “Nutri-Score” front-of-package label is now under attack by the food industry. However,a powerful trade group, which includes major manufacturers of breakfast cereals, candies and cookies, is encouraging its members to instead select another type of nutrition al label. The trade group’s position is aligned with that of six food conglomerates – Mars, Mondelez, Nestlé, Coca-Cola, Unilever et PepsiCo (known as the “Big 6”) – who announced in March that they intended to develop an alternative system for the European Union. With his nutritionist colleague, Chantal Julia, he describes in The Conversation what this fight is about. I particularly like their example of how the two schemes help (or do not help) consumers choose between a yogurt and a fruit puree. The Conversation article also comes in a French version. FDA: What is happening with front-of-package labels? The FDA issued its final rules for the Nutrition Facts panels, but now I want to know: What ever happened to its front-of-package (FOP) initiatives? The New York Times editorial on the new food label raised this very question. But the labels, which most food companies will have to use by July 2018, still have serious limitations. They require busy shoppers to absorb a lot of facts, not all of which are equally important, and then do the math themselves while standing in the grocery aisle. And the labels are on the back of the package, where only the most motivated shoppers will look. The editorial refers to the FDA’s front-of-package initiatives early in the Obama administration. These involved two reports from the Institute of Medicine. The first, released in 2010, examined about 20 existing front-of-package schemes cluttering up the labels of processed foods and evaluated their strengths and weaknesses. It recommended that FOP labels deal only with calories, saturated fat, trans fat, and sodium. My question at the time: why not sugars? The committee’s answer: calories took care of it. But the IOM’s second report in 2011 included sugars and recommended a point system for evaluating the amounts of it and those nutrients in processed foods. Packages would get zero stars if their saturated and trans fat, sodium, or sugars exceeded certain cut points. the Grocery Manufacturers Association [GMA] called the Institute of Medicine’s recommendation “untested” and “interpretive.” Along with the Food Marketing Institute, it developed its own front-of-package labeling system, which includes some useful information, but is more complex and less helpful than the institute’s version. As I stated at the time, the FDA let the GMA get away with this and has said not one more word about front-of-package labels. According to the Times, the FDA is still studying the matter. it’s not clear when or if the agency will require front-of-package labels. The food industry, of course, wants to make its products appear as healthy as possible. The F.D.A. would serve consumers best by taking the Institute of Medicine’s good advice and putting clear and concise nutrition labels right where most shoppers will see them. It certainly would. It’s time to take those IOM reports out of the drawer and get busy writing rules for them.